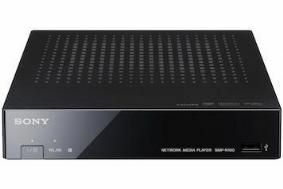 UPDATED: Sony set to launch budget video-streaming Netbox | What Hi-Fi? The streaming device brings all the benefits of Bravia Internet Video to any TV, including Sony's own Qriocity service, BBC iPlayer, Demand Five and movie rentals via Lovefilm. It connects to a home network using either Ethernet or Wi-Fi, and to the TV using HDMI. Other connections run to component and composite video out, and a choice of stereo analogue or optical digital audio output. UK pricing for the SMP-N100 is yet to be announced. Just announced by Sony in the USA is the SMP-N100 Netbox, a $129 (£85) Wi-Fi streaming client able to deliver network-stored content to a TV and home cinema system, as well as accessing online services such as Sony's own Bravia Internet Video and Qriocity. Shown to journalists at the company's US HQ in San Diego, California, the compact box offers a full range of Bravia Internet Video services including YouTube browsing, has access to a variety of exclusive 'channels' such as FIFA and the Berlin Philharmonic. With a suitable account, it can also be used for video on demand services such as Netflix and that Sony Qriocity offering. In addition, it can stream a wide range of video and audio content, plus still pictures, from local network storage such as PCs and Network Attached Storage (NAS) devices, connecting to the home network using either its internal 802.11n Wi-Fi or via an Ethernet cable. There's also a USB socket for playback of content stored on memory devices. The SMP-N100 can play MPEG-1 Video/PS, MPEG-2 Video/PS and TS, DivX, WMV9 and AVCHD video files; MP3, AAC, WMA9 and LPCM audio and JPEG still images, and offers an output resolution of up to 1080p. As well as HDMI for video and audio, video outputs are provided on component and composite video sockets, and the unit has analogue stereo, plus optical and electrical digital audio outputs. Measuring just 18.5x4x19.3cm (WxHxD), it comes complete with a remote handset, and can also be controlled by free apps available for both Apple's iOS platform and Google's Android. There's no news yet on UK availability.